Jean-Eric Vergne (Techeetah) wins the Punte del Este ePrix in Uruguay, the sixth round of the 2017/2018 FIA Formula E Championship. It’s the second win this season for the French driver who extends the lead in the championship. Vergne started from pole and led for all 37 laps. He won ahead of reigning world champion Lucas di Grassi (Audi Sport Abt Schaeffler) and Sam Bird (DS Virgin Racing). Di Grassi was the fastest in qualifying but penalty demoted him to the second place, where he stayed for the entire race. 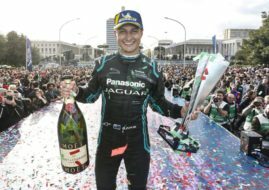 Other point scorers in Uruguay are Mitch Evans (Jaguar Racing), Felix Rosenqvist (Mahindra Racing), Alex Lynn (DS Virgin Racing), Oliver Turvey (NIO), Jose-Maria Lopez (Dragon Racing), Jerome d’Ambrosio (Dragon Racing) and Maro Engel (Venturi). After six rounds, Vergne leads the championship with 109 points, thirty more than Rosenqvist. Bird is third with 76 points. In the teams’ classification, Teecheetah leads with 127 points, ahead of Mahindra Racing with 100 points. The next championship round is the Rome ePrix, scheduled for April 14 in Italy’s capital.